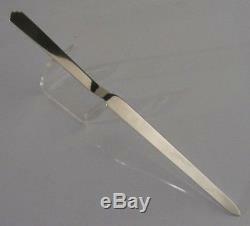 A beautifully designed solid sterling silver letter opener. 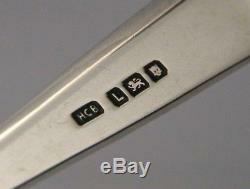 It is hallmarked for London 1946 with the makers marks being HCB. It has a very unusual modernist Art Deco design having a stepped handle and unusual shape. It is in superb condition being free from dings splits distortions and repairs. 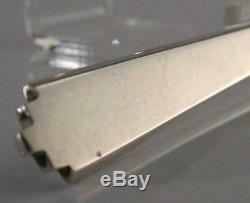 It measures 8.75 inches (22cms) long by 0.5 inch (1.3cms) wide and weighs 45 grams. A beautifully designed well made piece. If you have any queries etc... To see lots more rare and beautiful silver. All items are cleaned and display ready should you be a retailer or collector, or ready to wrap should you be purchasing a gift. That way we save you time and we discover any faults, not you. 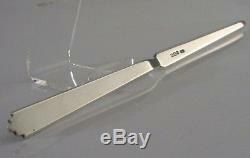 The item "ART DECO MODERNIST SOLID SILVER LETTER OPENER 1946 ENGLISH ANTIQUE" is in sale since Sunday, August 12, 2018. This item is in the category "Antiques\Silver\Solid Silver\Other Solid Silver". The seller is "spidermonkey10" and is located in London.